Entertaining: What’s Cooking? It’s Yellow! Here is what’s cooking this weekend by the bay and I’m keeping it yellow, hopefully as yellow as the sun brightly shining in the sky. 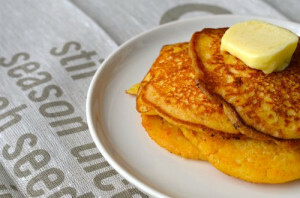 To kick off my weekend of sunshine eating, I’m making my Cornmeal and Sweet Corn Pancakes. A delicious start to any weekend, using some farm fresh yellow corn or use your leftover corn from the night before mixed with some corn meal . 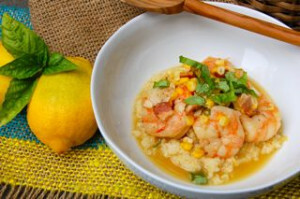 Dinner is a nice bowl of Fresh Corn with Shrimp Grits, it doesn’t get better than a bowl creamy grits made with a corn broth, cooked along with shrimp and bacon and splashed with lemon juice to brighten the flavor. Served on the side a nice plate of yellow tomatoes, simply drizzled with a good olive oil and sprinkled with coarse sea salt and fresh ground black pepper. Perfection. 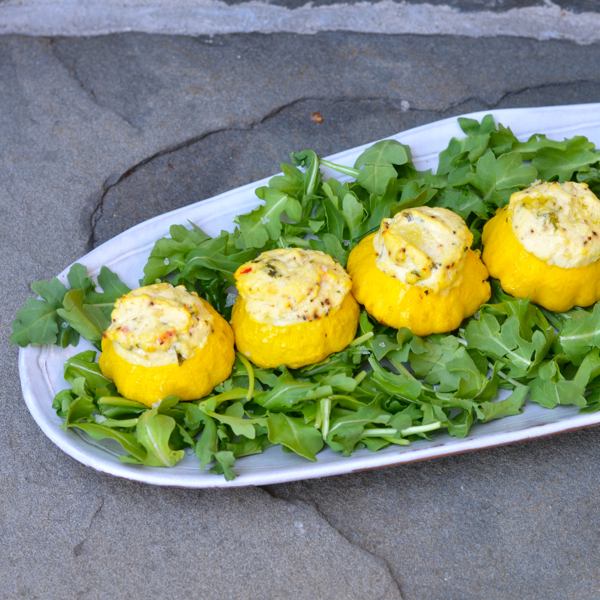 Sunday Lunch, I’ll be keeping it light and serving Ricotta stuffed PattyPan Squash , I like to find lovely smaller squash to fill and serve on a bed of arugula. 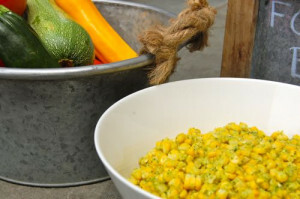 Along side this another great yellow dish is Fresh Corn and Zucchini Salad. A weekend of great food! From by the bay, wishing you sunny yellow food memories! This entry was posted in breakfast, desserts, main dish, pudding, salads, seafood, side dish and tagged corn recipes, cornmeal and sweet corn pancakes, cornmeal recipes, fresh corn and zucchini salad, fresh corn with shrimp grits, grit recipes, lemon posset, pancakes, ricotta stuffed pattypan squash, shrimp recipes, squash recipes, summer recipes, yellow, zucchini recipes on July 27, 2017 by entertainingbythebay. 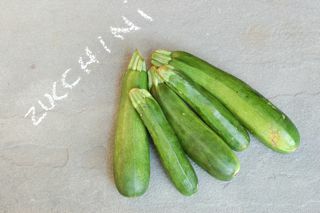 Zucchini – one of the favorite staples of the summer harvest is showing up in farmer’s markets and grocery stores. If you are lucky like me it shows up at your door courtesy of a generous neighbor with a fabulous vegetable garden. 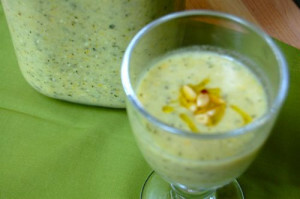 No matter how you get that zucchini into your kitchen you must try this recipe for chilled zucchini soup. 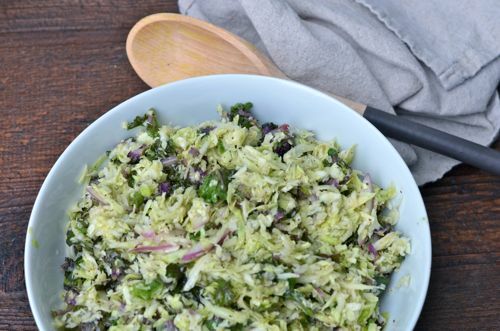 Super simple to make this is a refreshing treat to enjoy for lunch or dinner. Try drinking this cup of summer freshness! From by the bay, wishing you chill food memories! In a large pot heat olive oil and sauté the white onion until softened about 5 minutes. Add the zucchini, salt and pepper stirring occasionally until the zucchini is softened, about 5 more minutes. Add the broth to the pot, bring to a boil and then reduce heat and simmer until the zucchini is tender, about 5 more minutes. Remove from heat and let cool. 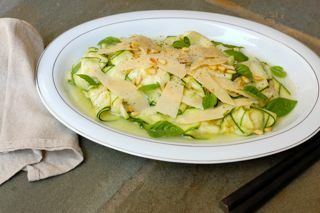 Using a food processor puree the zucchini mixture along with the parmesan cheese, pine nuts, mint and lemon juice. Pour into a bowl adding the buttermilk and blend. Cover and place in the refrigerator to cool for at least 3 hours. Adjust seasoning with coarse sea salt. Serve chilled and garnish with toasted pine nuts and a drizzle of olive oil. This entry was posted in soups and tagged buttermilk recipes, Chilled Zucchini Soup with Mint, lemon recipes, mint recipes, parmesan recipes, pine nut recipes, summer recipes, zucchini recipes on July 11, 2017 by entertainingbythebay. My Five Favorite Recipes of 2015! The of the year is a time for reflection, of course, my mind turns to food! I looked back on my 2015 blog recipes and have selected my favorite recipes of 2015. 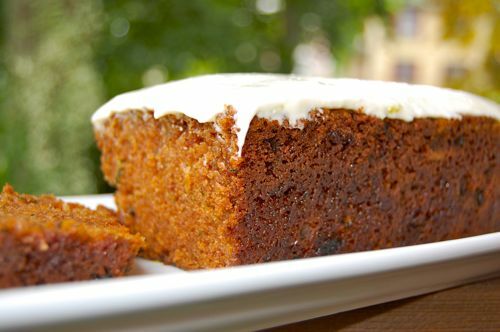 The main criteria for my selection is the number of times I have made this recipe during the year…….so drum roll please for my top recipe picks for this year. These are recipes you will want to try and use over and over again as well! From by the bay, thank you for your interest in this blog and wishing you all a very Happy and Healthy 2016! See you next year! 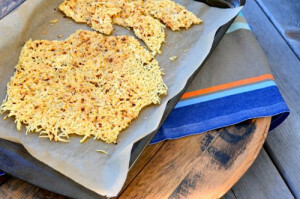 Preheat oven to 350 degree F. On a parchment lined baking sheet , take half the shredded parmesan and form a rectangle approximately 8″ by 12″. Sprinkle half the chili flakes and all the salt uniformly over the cheese. Layer the remaining cheese lightly pressing down. Sprinkle the remaining chili flakes over the cheese. Bake in the oven until golden brown, approximately 10 minutes. Cool and break into piece. Store in an air tight container until ready to serve. Put the butter and oil in a large, deep skillet or saucepan over medium heat. 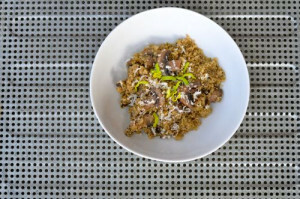 When it is hot, add the fresh mushrooms, and cook, stirring occasionally, until the mushrooms begin to brown, about 5 minutes. Add the leeks and cook until they soften slightly, about 2 minutes. Add the quinoa, and cook, stirring occasionally, until it’s glossy and coated with butter and oil. Sprinkle with chili flakes, thyme, salt and pepper, and then add the parmesan rind, broth and wine. Continue to cook, stirring frequently and adding stock as necessary; the mixture should be neither soupy nor dry. Begin tasting the quinoa about 20 minutes after you added it; you want it to be tender but not mushy and to have released some of its starch. Once it reaches that stage, after about 25 minutes, remove the rind and stir in some grated parmesan cheese, along with a little more butter or oil if you like. Stir until the cheeses melt; taste and adjust the seasoning, and serve. To make dressing combine all the ingredients in a food processor and first pulse and then mix until emulsified. Pour dressing over salad and mix well. Serve cold or at room temperature. In a large bowl combine all ingredients. Let marinate for at least one hour or refrigerate until ready to serve. Preheat the oven to 325°. In a food processor, pulse the graham crackers with the sugar and salt until finely ground but not powdery. Add the butter and pulse until the crumbs are evenly moistened; transfer to a 9-inch springform pan and press into the bottom and two-thirds up the side. Set the pan on a rimmed baking sheet. In a medium bowl, whisk the condensed milk with the lemon juice. 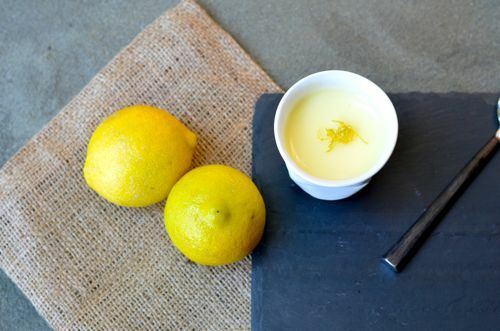 In another bowl, using a handheld mixer, beat the lemon zest with the egg yolks until pale. Beat in the condensed milk mixture until smooth. Pour the filling into the crust. Bake the pie for 25 minutes, until the center jiggles slightly and the edges are set. Transfer the pan to a rack; let cool for 1 hour. Loosely cover the pan with plastic wrap and freeze the pie for at least 6 hours. Wrap a warm, damp kitchen towel around the side of the springform pan to release the pie; remove the ring. 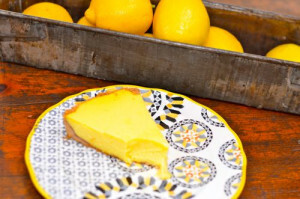 Using a hot knife, slice the pie, transfer to plates and serve. This entry was posted in appetizer, desserts, main dish, pies, salads, side dish, vegetarian and tagged chili parmesan crisps, five favorite recipes, jalapeno kale coleslaw, jalapeno recipe, lemon ice box pie, lemon re, mushroom quinoa risotto, mushroom recipes, pineapple recipes, red chili flakes, spicy zucchini pineapple salsa, top 5 recipes, vegetarian, zucchini recipes on December 30, 2015 by entertainingbythebay. I can get so caught up shopping at the farm stand this time of year. This past weekend I did just that and found myself staring at a few too many zucchini on my kitchen counter. As a result I grated the zucchini and added to my favorite cornbread recipe with some fresh basil and result was a moist and fresh tasting bread. Which tastes great the next day if you have any leftover. This bread is a big hit here by the bay! 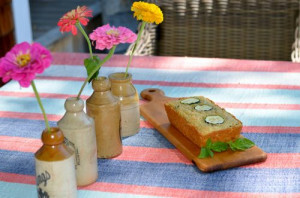 From by the bay wishing you yummy zucchini food memories! Preheat oven to 350 degrees F. Butter 1 medium loaf pan. Fill a small bowl with ice water. Bring a small pan of water to a boil, add the basil leaves into boiling water for 15 seconds. Remove leaves and plunge into the ice water to stop the cooking. Remove leaves from ice water, dry and chop. Set aside. Take the zucchini, cut off each end. Cut three rounds 1/8 inch thick from one end of zucchini and set aside. Grate the zucchini coarsely, using a box grater, until you have 1 cup of grated zucchini. In a large bowl combine well the dry ingredients: flour, salt, cornmeal, sugar and baking powder. In a separate medium bowl combine and beat buttermilk, eggs and butter. Fold into this the chopped basil and grated zucchini. Pour wet ingredients into the bowl with the dry ingredients and stir well. Pour the batter into the loaf pan. Top batter with the 3 zucchini rounds. Place pan onto baking sheet and bake for about 55 minutes until the tester comes out clean. Cool on metal rack for 10 minutes. When cool remove bread from pan. Serve warm or room temperature. This entry was posted in Bread and tagged baking, basil recipes, corn bread recipes, corn meal recipes, summer foods, summer recipes, zucchini recipes on May 25, 2014 by entertainingbythebay. My friend Eva, make my day with a basket of vegetables, the results of the summer harvest in her garden. The basket was filled with beautiful eggplants, zucchini, squash and tomatoes. I remembered how my mom Ceil, would love to make ratatouille every summer using these same ingredients. It was a staple barbecue side dish, when we were in the height of summer. I’ve tried different variations and this by far is my favorite and reminds me the most of mom’s only with a few extra ingredients to kick up the volume on the taste. Tyler Florence really has the ultimate recipe, so no need for me to mess around. I’ve offered a few suggestions below for ingredient options. For example, instead of opening a tin of anchovies, I always keep a tube of anchovy paste handy in the fridge. I like how the paste just melts into the dish as an ingredient. I made this over the weekend and used the leftovers the next day for pasta. Celebrate the summer harvest using this recipe! From by the bay wishing you great summer harvest food memories! Line a large platter with paper towels. Heat 1/3 cup olive oil in a medium saucepan over medium heat. Add the eggplant, season generously with salt and pepper, and let that cook down for 10 to 12 minutes, until the eggplant is soft and wilted. Remove the eggplant from the pan and onto a platter to drain. Next stop, zucchini: cook it the same way in 1/4 cup oil, then add it to the platter with the eggplant. Add another 1/4 cup olive oil to the pan, then the anchovies or paste, onions, garlic and herbs. Cook for 5 to 7 minutes, until the onions get nice and caramelized. Add the tomatoes and cook that down for 10 to 12 minutes, until pulpy. Return the eggplant and zucchini to the pan, crack open the chile, and add that too or season with red chili flakes. Season with salt and pepper and let the ratatouille cook slowly for about 20 minutes, until the mixture is soft, mushy and juicy; you want all the flavors to come together. Stir in the vinegar and let cool to room temperature. Cook pasta according to directions. Once cooked set aside 1/2 cup cooking water. 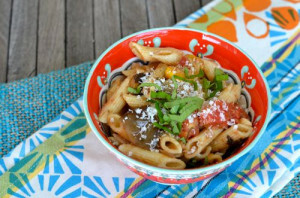 Place the penne in a bowl, top with room temperature ratatouille, grated cheese and cooking water. Mix well. Top with a little more grated cheese and basil. Serve immediately. This entry was posted in Pasta, side dish and tagged basil recipes, eggplant recipes, herb recipes, penne recipe, tomato recipes, Tyler Florence, vegetarian recipes, zucchini recipes on May 25, 2014 by entertainingbythebay. It’s after Labor Day, and the signs of fall are sadly arriving everywhere. Acorns are dropping onto the deck, leaves are gently falling into the pool, evening’s are getting a little cooler and the farmer’s market stalls are starting to fill with up with chrysanthemums and gourds. I am determined to savour the end of summer by snapping up in my shopping basket eggplant and summer squash. Once I arrive home, I enjoy the task at hand , figuring out what I’ll make with all that eggplant and squash. 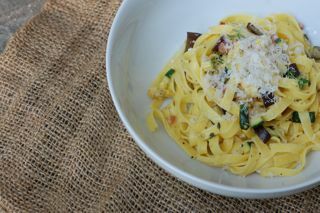 I came up with this easy pasta dish , which is light and delicious and uses alot of fresh eggplant and squash. Roasting vegetables in a little olive oil , can make the most finicky eater love vegetables. I chopped the vegetables into nice little cubes, toss with a little olive oil, thyme, salt and pepper and roast in the oven. Next, I saute until crisp some great quality slab bacon or pancetta also cut into cubes. Cook some pasta and use some grated cheese and you have a fantastic meal. Enjoy your last days of summer with some fresh vegetables and savour the moment! From by the bay, wishing you memorable end of summer food memories! 8 ounces dried pasta such as tagliatelle or thin spaghetti, cooked according to directions. Preheat oven to 400 degrees F. Dice your eggplant and summer squash into cubes, approximately 1/4 inch in size. Dice your bacon or pancetta into similar size cubes. Line two roasted pans with foil. Place the eggplant cubes on one pan and toss with 1 tablespoon olive oil, coating the cubes. On the second pan add the squash, thyme and remaining olive oil. Toss well coating the squash. Place both pans in the oven and roast in the oven for about 20 minutes until the vegetables become soft and start to brown. Watch the vegetables as cooking time could vary depending on the cube size. Remove from oven and place in bowl and keep to the side. While the vegetables are roasting in the oven take a medium saute pan and add the pancetta or bacon and cook until crisp. Drain on a paper towel. Cook the pasta according to directions. Just before straining the cooked pasta, reserve 1 cup of cooking water. Place the pasta in a bowl , add the roasted vegetables, bacon and cheese. Add some of the cooking water to make the sauce creamy. Add salt and pepper to taste and serve immediately. This entry was posted in Pasta and tagged eggplant recipes, fresh vegetables, pasta recipes, summer food, summer recipes, summer squash recipes, vegetarian recipes, zucchini recipes on May 24, 2014 by entertainingbythebay. Place a dry small pan on medium heat, add the pine nuts and toast in pan until they start to brown. Remove from heat and keep to the side. 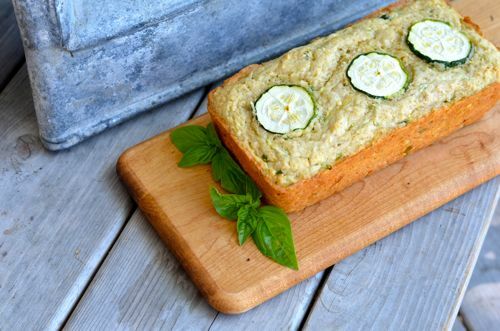 Take the zucchini and cut off the ends. Use a mandolin or box grater to slice thinly the zucchini length wise. Place on platter. Dress with the olive oil, lemon juice, salt and pepper. Mix well. 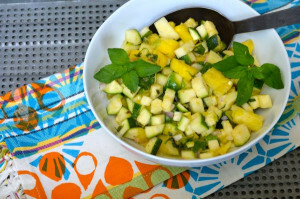 Let sit at room temperature for at least 1 hour before serving, allowing the zucchini slices to marinate. When ready to serve, top with the pine nuts, basil torn into pieces and the shaved Asiago cheese and then serve. This entry was posted in salads, side dish and tagged asiago cheese recipes, cheese recipes, pine nut recipes, summer food, summer recipes, summer sides, zucchini recipes on May 24, 2014 by entertainingbythebay. It’s the beginning of September , Labor Day is this weekend and it’s time to take advantage of the abundance of fresh corn that is still available. Here are two more recipes to try this weekend. Both of these recipes are tasty ways to think of fresh corn beyond eating on the cob. The first recipe is for cooked corn with a fresh zucchini dressing to create a lovely side dish that would compliment any main course. The second recipe features corn as the main event by creating a corn pesto to use on pasta. 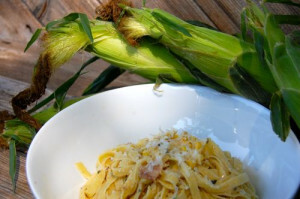 Using corn as the base of the pesto makes a sauce that is creamy in texture and very delicious! 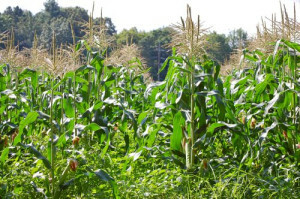 So run out this weekend, buy some corn and give a try to these recipes . Have a wonderful holiday weekend! From by the bay, wishing you bright and fresh food memories! Cut corn off off the cob and place in a bowl. Add to a food processor mint, chives, zucchini, lemon juice , salt and pepper and blend. Slowly add the olive oil and continue to blend to a smooth consistency. Pour dressing on top of corn and mix well. Serve at room temperature. In a frying pan cook bacon until crisp, drain and place to the side. While bacon is cooking cut the corn off the cob. Once the bacon is done cooking, keep 1 tablespoon of the rendered fat from bacon and place frying pan back onto a medium heat and saute the corn for 2-3 minutes until tender. Remove from heat and let cool. Take half of the corn and place into a food processor along with the pecans, remaining olive oil, cheese, basil and salt and pepper and blend until it’s a creamy consistency. Cook pasta as directed, before straining take 1 cup of hot pasta water and place to the side. Place the strained pasta into a bowl, top with the corn mixture, remaining whole corn kernels and 1/2 the pasta water. Mix well. You are looking for a creamy sauce that covers the pasta well, , add more water if needed. 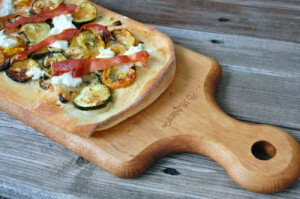 Sprinkle the top with crumbled cooked bacon and more parmesan cheese. Serve immediately. This entry was posted in Pasta, salads, side dish and tagged barbecue recipes, corn recipes, corn salad, fresh vegetables, pasta recipes, pesto recipes, summer foods, summer recipes, summer sides, summer squash recipes, vegetarian recipes, zucchini recipes on May 23, 2014 by entertainingbythebay. Walking into my favorite farm stand on the weekends always reminds me of my childhood when I walked along the side my grandmother to pick vegetables and foods to prepare for the next meal. The walk was always filled with a beautiful array of colors and shapes. With produce at it’s glorious peak right now I have the same experience at the local farm stand. 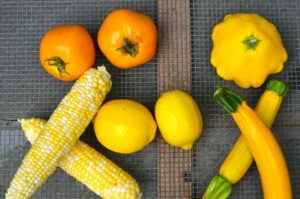 This week, I was confronted with an abundance of zucchini and summer squashes in a riot of colors – from sunshine yellow to pale green. I gathered a wide of variety of squash filling a basket , added some onions , mint and thyme and made my way back to the kitchen to try a few different recipes. I’m sharing here with you the best fruit of my labor. From by the bay wishing you the sunniest of food memories! Preheat over to 400F. 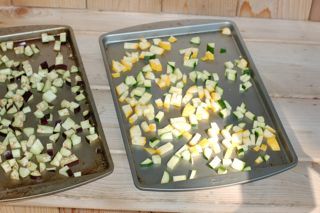 On a lined baking sheet add zucchini and squash sliced into 1/4″ rounds. Next add the onions thinly sliced. Drizzle with olive oil and sprinkle with salt an pepper. Place in oven to roast until vegetables begin to brown, approximately 30 minutes. Remove from oven and set aside to cool. When ready to made the pizza preheat oven to 500F. Divide the pizza dough into two portions. Spread some semolina flour on a clean surface to roll dough and also a little on top. Using a rolling pin, roll each portion into a rectangle approximately 15″ by 5 ” . Bake each pizza in the center of a pizza pan. Divide the toppings on to each rectangle first the roasted squash and onions, then little bits of ricotta cheese, sprinkle with the parmesan cheese, thyme leaves removed from sprigs and finally tear the prosciutto into pieces and add to the top. Bake in the oven until crisp approximately 15 minutes. Sprinkle with coarse sea salt and serve. This entry was posted in Pizza, soups and tagged buttermilk recipes, fresh vegetables, mint recipes, pizza recipes, soup recipes, summer food, summer recipes, summer squash recipes, vegetable recipes, vegetarian recipes, zucchini recipes on May 23, 2014 by entertainingbythebay.